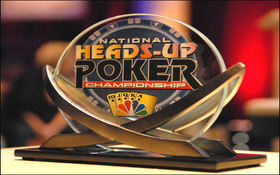 The full roster for the upcoming NBC National Heads-Up Poker Championship was released today, and now that the entire 64 player field is known I thought I would take a look at some of the favorites amongst the field. First, here is a look at the complete 64 player field: The majority of entrants are poker players, including Phil Galfond, Sorel Mizzi, Patrik Antonius, Phil Gordon, Chris Moneymaker, Eric Baldwin, Barry Greenstein, Daniel Negreanu, David Benyamine, Bertrand Grospellier, Scotty Nguyen, Andy Bloch, Joe Hachem, Annette Obrestad, Liv Boeree, Gus Hansen, Dennis Phillips, James Bord, Jennifer Harman, Dwyte Pilgrim, Doyle Brunson, Phil Hellmuth, John Racener, Joe Cada, Phil Ivey, Greg Raymer, Daniel Cates, Faraz Jaka, Vanessa Rousso, Johnny Chan, John Juanda, Kara Scott, Huck Seed, Nicolas Chouity, Frank Kassela, Erik Seidel, Allen Cunningham, Eugene Katchalov, Vanessa Selbst, Jonathan Duhamel, Annie Duke, Howard Lederer, Phil Laak, Gavin Smith, Tom Dwan, Peter Eastgate, Ayaz Mahmood, Melburn Whitmire, Eli Elezra, Thomas Marchese, David Williams, Antonio Esfandiari, Mike Matusow, Justin Young, Chris Ferguson, Jason Mercier, Ted Forrest, Michael Mizrachi, and Erick Lindgren. Joining the poker pros will be celebrity participants Don Cheadle, Jason Alexander, Gabe Kaplan, Emmitt Smith, and Jennifer Tilly. · Daniel ‘jungleman12’ Cates: Cates is an online cash-game specialist who plays a ton of heads-up poker, and won over $5 million online last year. Cates is a feared heads-up NLHE player, and despite his youth he has probably logged as many heads-up NLHE hands as any other player in the field. · Faraz ‘the toilet’ Jaka: another online player, Jaka is a feared tournament player and one f poker’s rising stars. Jaka plays a lot of short-handed poker, and as an online player, Faraz knows how to use the math of the game to make heads-up adjustments. · Liv Boeree: Boeree was sort of a novelty in poker, a rock-guitar playing, Astrophysicist, with model good-looks; until she won the EPT San Remo last year. Since then Boeree has elevated herself into the upper echelon of tournament players, including picking up two big online wins in 2011 already. This entry was posted on Thursday, February 24th, 2011 at 7:41 am and is filed under Poker News. You can follow any responses to this entry through the RSS 2.0 feed. You can leave a response, or trackback from your own site.